Home > Meet the Doctors > Kira Powell, M.D. Dr. Powell was born in Louisville, KY but grew up in southern Indiana. 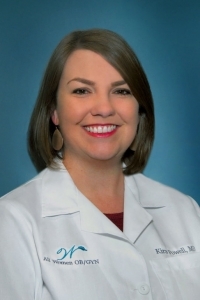 She received her undergraduate and Medical Degree from University of Louisville, and completed her Obstetrics and Gynecology residency at Mercy Hospital in St. Louis, Missouri. Her love for women’s health has flourished through mission work in Ecuador, as well as research in treatment of menopausal symptoms and routes of hysterectomy. She is married to her husband John and is a proud mother of two children, Lucy and Baxter. She is an avid animal lover including her two dogs, Gavin and Wrigley. She is excited to be moving back home to Louisville, and feels blessed to have the opportunity to provide care that is tailored to each patient’s stage of life.